Hi. I'm Courtney Campbell. I'm a guy who went with his father at age five to buy a 1st edition Players Handbook. We sat in a mall pizza outlet and flipped through it together. The image of A Paladin in Hell sold me. 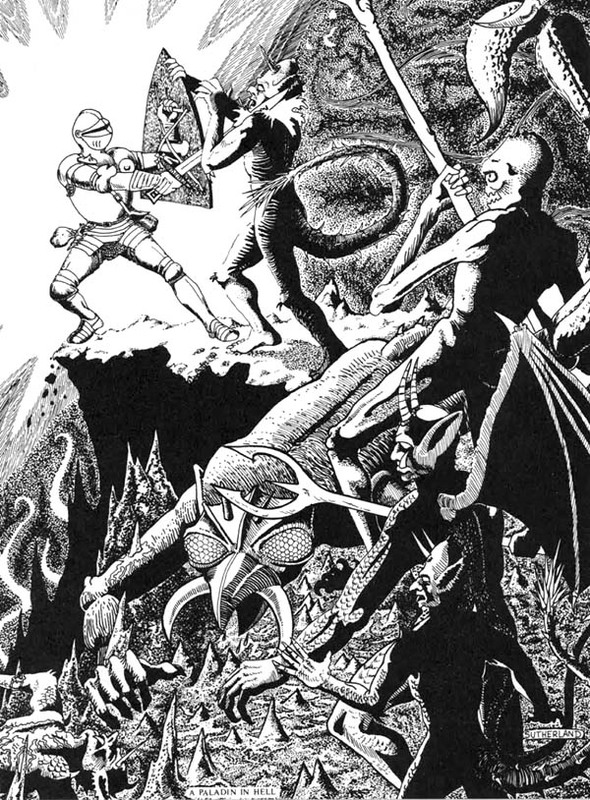 I've never been happier than when I've been playing, writing, drawing, or thinking about Dungeons and Dragons. I've always been an outsider to the industry. For the first 20 years, I cajoled my friends and acquaintances to play games with me. I taught people who were already my friends to play. It was important to have a game and get to do what I loved to do! My love for gaming got the better of me. I started a blog and I love it. I've been writing for over a decade. I contributed articles on an examination of theory, practical advice for running a game, analysis of traps and ways to run them effectively, classic tropes, top 10 lists and more! Click the image above and go check out the blog! You can check out my blog index for more. You know I really like Dungeons & Dragons. I recently jumped off a cliff and dived full time as a creative. Is this terrifying? Oh, yes. But the support of all the great patreons made this possible. I'm not falling; because of this patreon and people choosing to support it, I am flying. My daughter sees my smile and is happy and I know I made the right choice. This Patreon allows me to produce great content on a full time basis. My patrons have access to a richness of free copies of my products, like the awesome Megadungeon and Hexplore delivered right to them here automatically on Patreon, high definition maps for use in virtual table tops, and more! This is the direct result of great people taking action to put more of what they would like to see in the world! You too can take this action by simply supporting the patreon by clicking the button. What's more, are the rewards! Given the chance you can receive insider comments and commentary about posts, a link posted on my blog, access to pages from my personal notebooks every month, and more. And that's the way of the future I think. Here's to you and what we can do together! I will produce around 6 long form articles every month. These posts, along with all content on the blog is free, will remain free, and will be produced regardless of whether or not I get a single backer. Just look at the last six years of posts! These long form articles will be published in blocks of around 1,500 to 2,000 words depending on content. There will also be regular non-patreon supported content posted on other days. Any content I produce due to the funding of this campaign will be free to my readers also! I'm pretty sure this is one of the foundations of the Patreon system. You aren't buying blog posts, you're supporting journalists, artists, and musicians doing what they love and sharing it for free! Even your support at a dollar or two a month makes a substantial difference in my life! You are a subscriber to the Hack & Slash blog, delivered right to your desktop. My blog posts are already available for free on my blog Hack & Slash, published every weekday. I will send you an e-mail thanking you, and finding out how you discovered Hack & Slash, what your gaming interests are, and what type of content you like. I'll also add your name to a special subscriber section, where I will mention and link to your blog, your project, your Google+ profile or your website. All benefits of the subscriber level. I will take the time once a month to scan in a few pages from my notebooks. (Examples here and here). You can get a look at original and raw content, getting a glimpse at my maps, adventure design, design notes, art, miniatures or other creative gaming materials. I will give my daughter a big hug and kiss! I am intimidated and thankful by how much you like the blog! Every post of which is already free. You receive the benefits of all earlier backer levels. You get free .pdf copies and print copies of any written work I publish myself. Just contact me with your address and I'll ship them out to you. I promise no matter how much support you give me, I will still mercilessly kill any player character you run in any game you play in of mine, showing no favoritism and remaining a completely impartial adjudicator, just as Gygax intended. Right now, as a full time creator, I split my time between the blog and other projects. If the patreon reaches this goal, then I no longer have to worry and hustle to pay rent, taxes, and more. This is stability—and that means 5 posts a week, one for each day of the week. Only 6 of those will be paid during the month—but every morning, you'll have something fantasy related to read.